Do you have a rabbit problem? We can help you find a solution! You don’t have to poison them – there is an effective way to keep them away from your gardens peacefully. That way is rabbit repellents, which only help to deter them. In our rabbit repellent buying guide, we’ll tell you what you need to know and showcase the top ten repellents we found. Let’s get started! Here are some things you should know before you start shopping. Type: Like other pest control, rabbit repellents can come in a variety of mediums, including liquid or granules. What type it is determined how it works and how it’s applied, so get the type you prefer to use. Safe for Crops: Chances are you’re trying to keep rabbits away from your edible crops. So why would you choose a repellent that kills what you’re growing? Products that are safe for crops will keep pests away while protecting your livelihood. 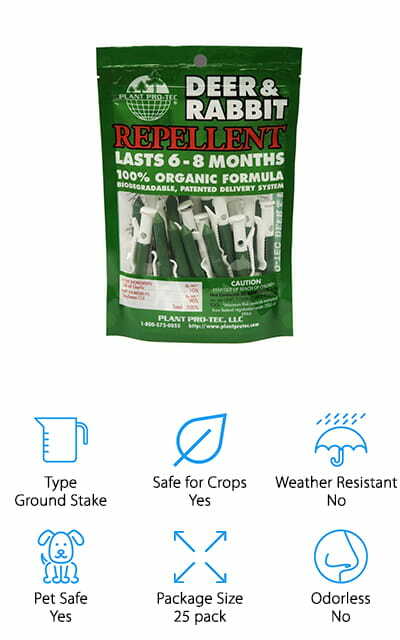 Weather Resistant: You don’t want to have to reapply the repellent every time it rains or snows. Weather-resistant repellants won’t lose their effectiveness in wet conditions, and you won’t need to reapply afterward. We think that’s pretty awesome. Pet Safe: If you have dogs, cats, or another animal that are going to be around the repellant, you want to make sure that it’s safe. Otherwise, it might make your animals sick if they come into contact with it. Package Size: This is simply how much you get for the price. Larger package size might seem like a better value, but some repellants are concentrated and actually make more than you’ll get with the larger quantities. Odorless: If your crops are close to your dwelling, or somewhere you’re going to be quite a lot, you aren’t going to want to smell it. Some repellents can get pretty smelly as a recourse against rabbits, so watch out. Now we can move onto our rabbit repellent reviews. We researched and reviewed a huge selection of the best rabbit repellents on the market to bring you our list of recommendations. In a hurry? Take a look at our top pick and budget pick first. They’ll show you what’s out there. The rest of our list is full of effective products that keep unwanted visitors away as well, so stick it out to the end! Nothing works quite like the Liquid Fence deer and rabbit repellent label. They make a variety of products, including granules and concentrates, to keep furry friends from munching on your garden. And they’re effective products, backed by a 100% Money Back Guarantee. If you aren’t satisfied, they’ll give you a full refund! That’s how sure they are that it will work! This liquid dries odorless so you won’t be able to smell it – only the animals will. It won’t make your pets sick, either, though most mammals will find the smell disagreeable and stay away from the area. Birds, however, will not be affected. It’s easy to use and keeps deer and rabbits away from flowers, crops, and trees – any plants you don’t want them eating, really. 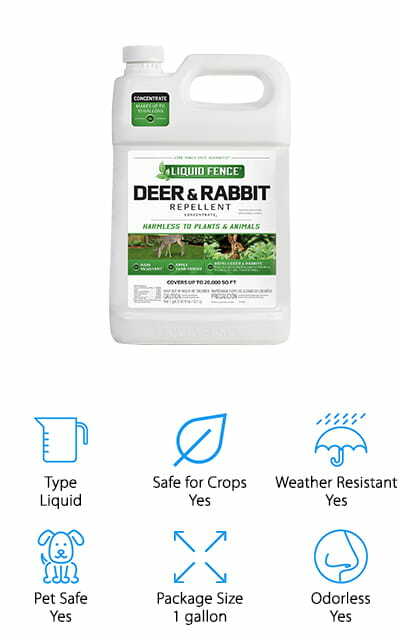 There are dozens of Liquid Fence deer and rabbit repellent reviews that all say the same thing – this stuff works! Keep your gardens safe this growing season! Ortho is the pest people – and that extends to pests of all kinds, not just insects. 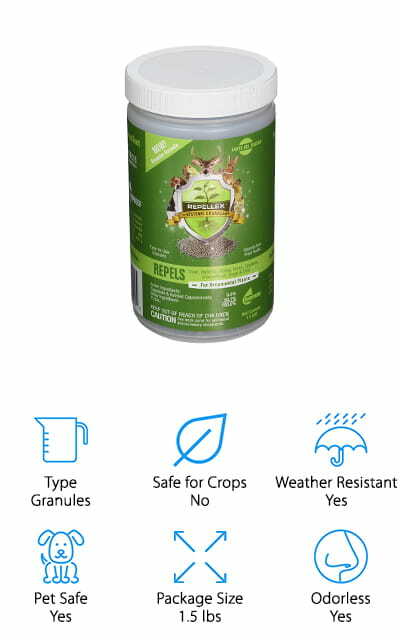 Their granules will keep rabbits and deer away for up to 30 days, even through rain and bad weather. You are free to use it in gardens where edible plants are growing; you just can’t let it touch any plants that you’re going to eat. This is only because it can affect the taste. Nothing about this repellent is poisonous. Rabbits and deer just don’t like the smell, and that’s why it works so well! Still, it’s formulated in such a way that we can’t smell it, making it pleasantly odorless to us. One 2-pound can of these granules is enough to completely cover 1,440 square feet when used correctly. Apply it liberally around your flowers and grass and it will keep pests away for up to 30 days. It’s the best cheap rabbit repellent that we looked at in our research! 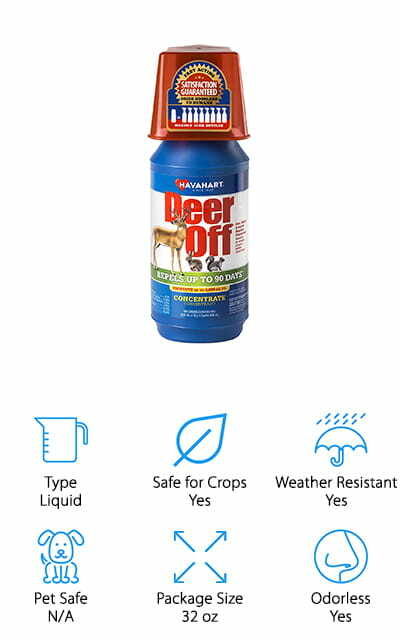 The Havahart Deer-Off Repellent is great for keeping rabbits, deer, and even squirrels off of your lawn and out of your garden! The formula uses a dual-deterrent system that targets both scent and taste to keep your plants looking great and the pests away. The smell even makes deer flee the area immediately, as it triggers their response to predators. This 32-ounce bottle makes eight times the solution – because the mixture ratio is 1 part Deer-Off to 7 parts water. It’s great for large properties and repeat usage. Spray it around your veggies or douse your ornamental plants to keep the deer and rabbits away for up to 90 days. It’s weather resistant as well, and the best part? It dries without any odor! You won’t have to deal with the smell that drives the pests away. The taste also does its part to stop deer from chowing down on the plants that you’ve worked so hard to grow. Repel PLUS works on a wide variety of pests, including chipmunks, rabbits, deer, voles, squirrels, and even groundhogs. It repels by scent and is environmentally compatible, so it’s harmless to the Earth. We love that! It’s also completely waterproof, so you won’t have to reapply after every rainstorm. It’s made of completely natural ingredients that are harmless to all creatures. They’re just repelled by the heavy smell. You can even use this as a bulb-dip so that your underground critters stay away! It’s a concentrate, so you have to dilute it with water to spray it. You can dilute it with between 5 and 8 parts water and use it every 1-2 months in the winter, and every 14 days in the summertime. 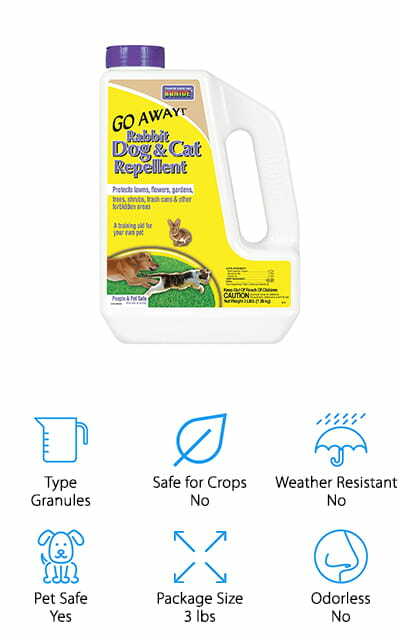 The best part is that the natural formula makes this rabbit repellent safe for dogs and other pets. We love that it’s natural and that it lasts so long in the winter time. These granules from Enviro Pro don’t require any mixing to work. They can be sprinkled around the areas you don’t want pests in during any conditions, and it won’t wash off with rain. However, it may need to be reapplied when there’s little to no rainfall, as this doesn’t allow its main ingredient to be activated. 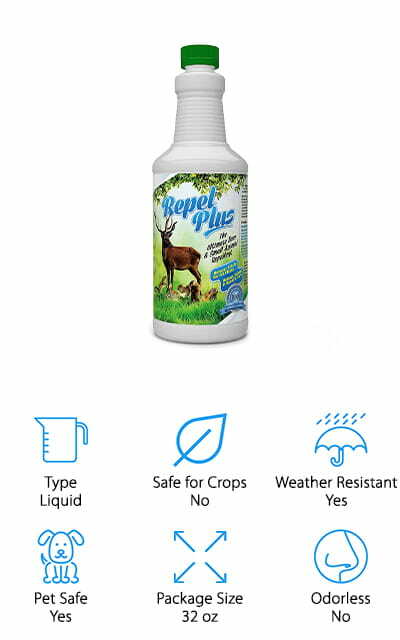 It’s not harmful to humans or animals at all, so you can use this deer and rabbit repellent around your pets and your kids with no worries. It’s specifically formulated for use in shrubs and flowers, but it also works great in gardens. And your crops will still be edible afterward! One of the best parts is that it’s completely odorless to humans, so you don’t have to smell any really terrible things while you’re keeping the rabbits away. The six-pound package that you get for this price will last you a long time without having to rebuy! 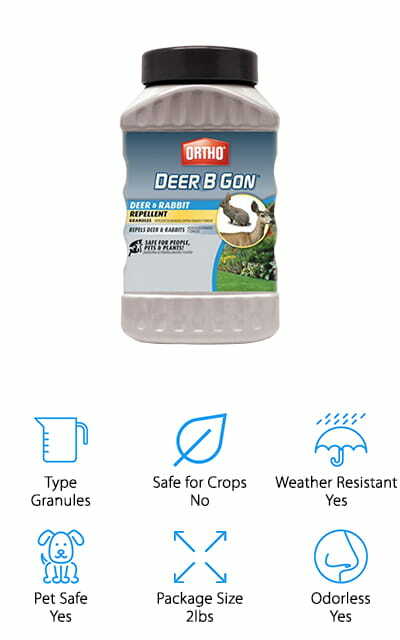 This Pro-Tech Rabbit Repellent is unique on our list because instead of being a liquid or granules, it’s a ground stake! These organic, biodegradable stakes are packed with garlic oil that animals can’t stand the smell of! These stakes last 6 to 8 months, so they’re pretty effective for a longer period of time. They are safe for absolutely everything, including pets and children, though they may be repelled by the smell. Humans are susceptible to the smell of these stakes. Most mammals don’t like the smell, so apply them anywhere near your plants, flowers, or shrubs and they won’t eat near them. These are probably the best rabbit repellent for lawns that we looked at due to the natural delivery system. You can simply set these up at intervals around your lawn and they will stay away! There are 25 in this package, so you can cover a pretty large area with this garlic-scented barrier! 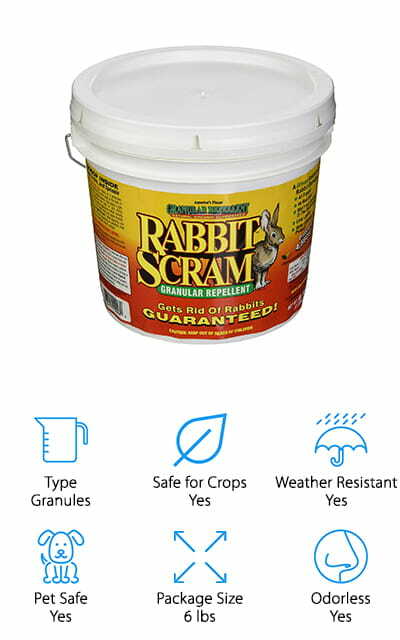 This Bonide Rabbit repellent for lawns treats up to 900 square feet of your garden or lawn and comes in a shaker top container to make it easy to spread. It’s completely non-toxic so it’s safe to handle; the active ingredients are white peppers and essential oils, which makes it organic and environmentally friendly. You can use it in gardens, but it shouldn’t touch food crops directly. The formula was specifically created to train animals to stay out of certain areas, and this extends to cats and dogs as well as rabbits. It will, however, keep cats from using your garden as a litter box! And it’s pretty good at keeping rabbits out of your crops and flowers as well. Protect your hard work from a wide variety of mammals with these granules. You will need to reapply after a heavy rain, but the shaker on the container makes it really easy every time! We love that! The Repellex Systemic Rabbit repellent works very uniquely compared to the other products on our list. This makes it a candidate for the best rabbit repellent for sale. Instead of using scent to keep the animals away, it absorbs into the roots of the plants you use it near so that they taste entirely different and not at all enticing. Because of this, of course, these granules should not be used in any sort of food crop, but work best in ornamental gardens and flower beds, as well as on lawns. You only need to sprinkle it around the base of the plants and rake it into the soil. A healthy rain will even help it absorb better. Even though it’s not ideal for veggie gardens, you only need to use one scoop per square foot and it doesn’t wear off. It only needs to be applied once per growing season. We think that’s pretty amazing! 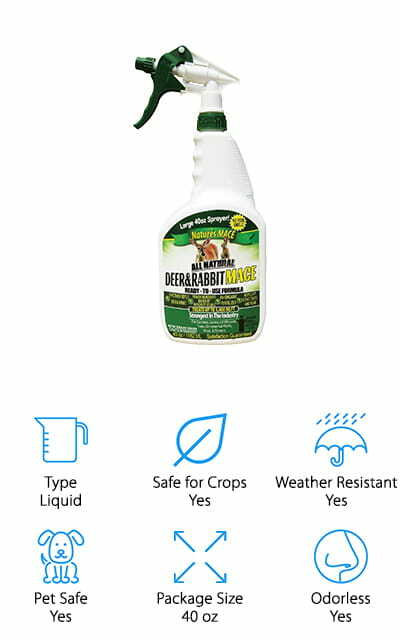 This liquid rabbit repellent spray is ready to use and doesn’t require any mixing because it isn’t concentrated. It’s made with completely organic ingredients, so it’s safe for edible crops and for use around your pets and kids. It lasts a really long time, due to the formula. It has three times the active ingredient that the competitors use in their formulas. We love that it’s safe to use in vegetable gardens without worrying! And if you aren’t completely satisfied with the way this product works, the company backs it with a one hundred percent money back guarantee! That’s how confident they are that it’s going to work. It uses a mixture of fear, scent, and taste technologies to keep your plants from being browsed. What’s even better is that this spray treats about 1,400 square feet of your garden or lawn. Get your long-lasting, widespread protection from Nature’s MACE. There’s no harm in trying it out! 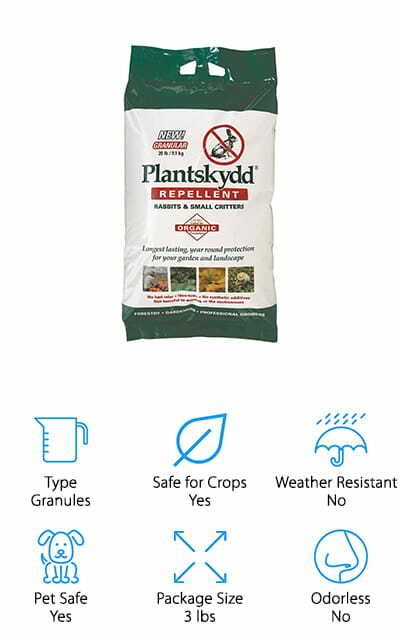 These Plantskydd granules are one hundred percent organic, biodegradable, and also works as a fertilizer! They come in a 3-pound shaker bag so you can apply them evenly without having to touch them – which is probably a good idea, even if they are nontoxic. They are completely made of dried pig or cow blood. Most mammals are repulsed by the smell, so they will keep away from your garden when you use these! You shouldn’t let these granules touch the edible parts of your plants, but only because they will so badly affect the taste. They are said to work on rabbits, voles, chipmunks, squirrels and other small rodents, though larger amounts can also work for deer, moose, or elk. Due to nature, it’s a good rabbit repellent for grass. And there’s enough in this bag to cover 1800 square feet. So many people have had tons of success with this repellent, so we couldn’t help but recommend it!